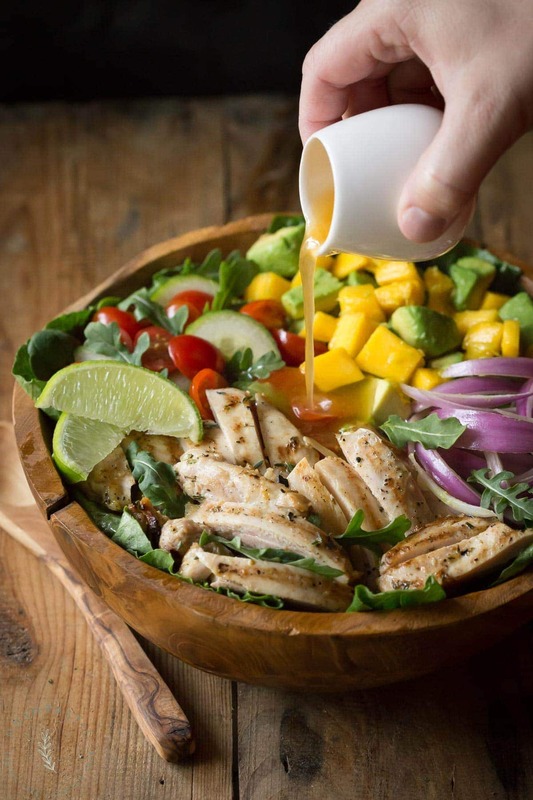 Chicken Avocado Salad with Honey Lime Dressing is such a fun summer salad! It’s jam packed with healthy ingredients including arugula, spinach, and mango. If you have homegrown tomatoes they would be fantastic to use in this Chicken Avocado Salad. If not, store bought will do and I usually buy cherry tomatoes as they taste sweet year round. 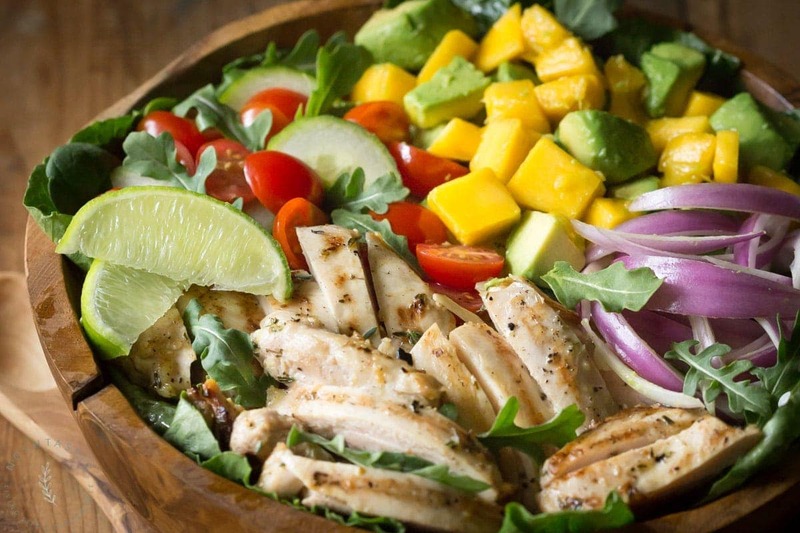 You really need to utilize the full marinating time for this chicken avocado salad! The chicken needs to marinate for at least an hour. This will allow the chicken to better take on some of the lovely flavors! If you don’t want to cook this on an outdoor grill you can simply use a cast iron grill pan instead, it works perfectly! The dressing can be mixed up ahead of time, just make sure to remix it before serving if it’s been sitting for a while as it might separate. If you can’t find mango, you can substitute another fruit such as peach, strawberry, or even tangerines. Mixing bowls – This is very similar to the set that I own, and they don’t take up a lot of space. Whisk – A good whisk is a must, you want one that will last. Wooden Salad Bowl – I have a bowl just like this, and it comes with ‘salad hands’ too. Cast Iron Grill Pan – I use this grill pan ALL THE TIME! it can even make real grill marks if you get it hot enough. 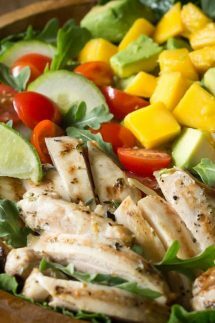 Chicken Avocado Salad with Honey Lime Dressing is such a fun summer salad! It's jam packed with healthy ingredients including arugula, spinach, and mango. Mix together the grilled chicken marinade and pour over the chicken. Marinate for 1 hour. Cook the chicken on a grill or in a cast iron grill pan with a little oil on a medium heat until it's cooked all the way through. 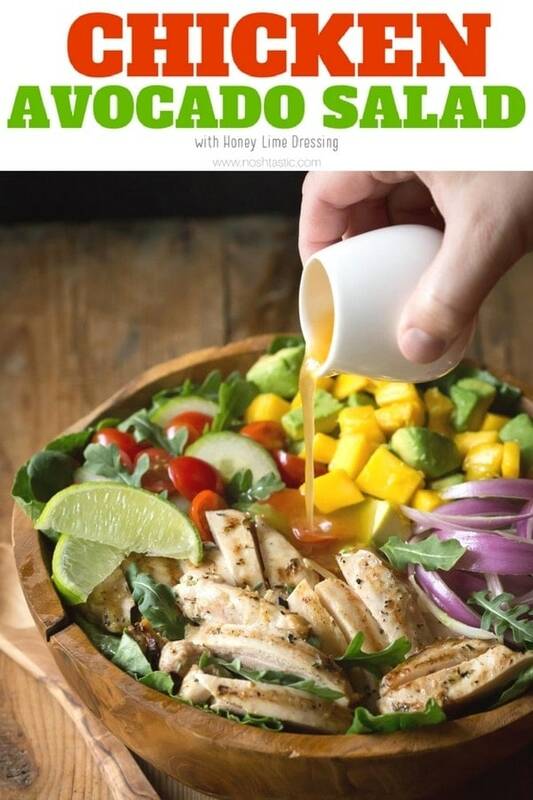 To make the honey lime dressing mix all the ingredients together to combine. taste and adjust the seasonings and honey if you need to. 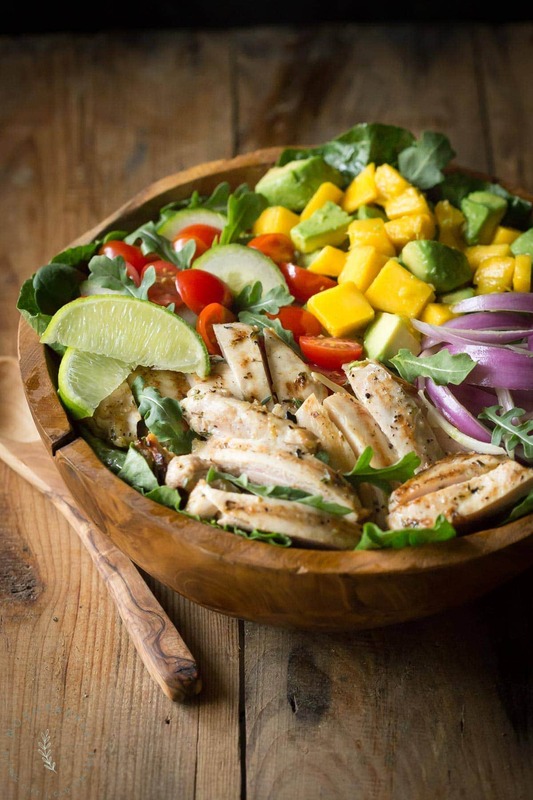 Assemble your chicken avocado salad by adding the romaine lettuce, arugula, baby spinach, grilled chicken, avocado, cucumber, cherry tomatoes, mango and red onion into a large bowl. Add as much salad dressing as you like, then toss salad. This sounds amazing! Is there supposed to be vinegar in the vinaigrette? Hi Noelle! Thanks pointing that out, it’s my error in the description calling the dressing a vinaigrette but it does not have any vinegar in it! I have fixed that now, the lime juice serves the same purpose in the dressing as vinegar would.